Traders seek to turn a serious profit from what they discover. For a Trader a new planet represents nigh-infinite potential for resource exploitation, while a new culture or hidden community is a customer base just begging for his particular talents. 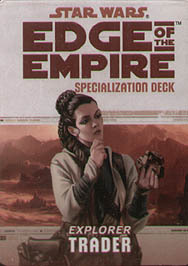 This deck requires the Edge of the Empire Core Rulebook and includes cards for all 20 talents available in the Trader specialization.